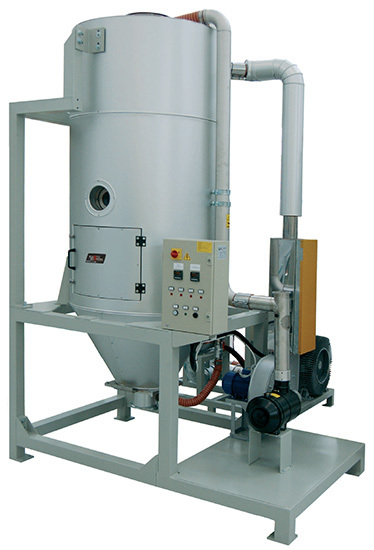 The hot-air dryers of the HAD series have been desig- ned to dry non-hygroscopic plastic granules. Non-hygroscopic plastic materials are polymers which trap the moisture on the surface of the granule and moisture content is never high. However, the processing of plastic materials with the presence of moisture may seriously affect the quality of the process and the finished product. These series of hot-air dryers are divided into two ca- tegories. The first category includes the range HAD30 - HAD200 with airflow rates from 70 to 200 m3/h that can be installed on the plasticing throat of the machi- ne. The second category includes the range HAD300 - HAD2500 with airflow rates from 200 to 1350 m3/h installable to the floor. • Stainless-steel hoppers with glass-fibre insulation equipped with a diffuser cone. • Hinged covers where you can install single-phase/ three-phase hopper loaders. • Insulated inspection door (from model HAD250).